The 22-year-old popstar will be kicking off the radio station’s big event, which will see 25 artists play both their own songs as well as covering other musicians’ tracks. 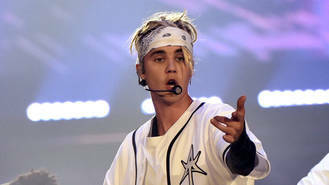 Justin’s recording session will be held in the comfort of his own L.A. property, while Usher – who helped sign the Sorry singer – will perform from a secret location in the City of Angels. “We are incredibly honoured to be working with the BBC Philharmonic on such a special and unique live performance. Huge thanks to Radio 1 for the opportunity to express our music in such an exciting way,” the group said in a statement. DJ and presenter Clara Amfo will host each Live Lounge event and has shared how excited she is about the 2016 line-up, dubbing it a “big one”. “To be invited into Bieber’s own L.A. home to hear him perform and to have The 1975 close Live Lounge month at Blackpool Tower Ballroom will make for some special moments, bring on September!” she said. Chance the Rapper has penned a track for the USA Olympics basketball team. Ozzy Osbourne has branded Bob Daisley's lawsuit against him as "tantamount to harassment". Selena Gomez shocked an Australian fan when she showed up at her house for breakfast earlier this week (beg08Aug16). Sarah Harding has teased that there might be a Girls Aloud reunion next year. Major Lazer have group therapy Skype sessions to help cope with the stress of success. Bruno Mars is reportedly in talks for a money-spinning Las Vegas residency. Ed Sheeran is being sued for allegedly copying elements of Marvin Gaye's 'Let's Get It On' hit. Lady Gaga recently reunited with her Sin City: A Dame To Kill For co-star Ray Liotta for a friendly dinner date in New York City.